The Visitor Center design reflects the heritage of old mining structures and is a great place to start your tour of Emerald Village. The Museum Gift Shop greets you upon entering, and features items for sale from these mines as well as from around the world. Clean restrooms and soft drinks are available. You’ll enjoy looking at jewelry, minerals, decorative items, and goodies for the kids. We also make and sell delicious fudge in a variety of flavors. Be sure to ask for a free sample. Our fudge rocks! As part of the Mining Museum tour spend a little time exploring the two upper floors of the Visitor Center, with displays on Bon Ami soap and our mountain tobacco heritage. Buy a can of Bon Ami scouring powder to take home. It’s good stuff! 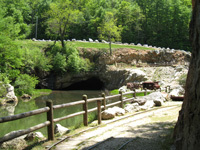 Admission to the Bon Ami Mine is $8.00 for adults, $7.00 for seniors over 60, and $6.00 for students. Click here for special group rates. A 12-page full-color souvenir booklet serves as your guide for the self-guided trail into the mine. Come at any time and no reservations are necessary. Allow 30-45 minutes for the mine tour. You’ll see impressive displays of old mining lamps and mining equipment. The booklet guides you at your own pace with facts about the historic equipment and the mine. The Bon Ami Mine opened around 1924 to provide feldspar used in the production of Bon Ami scouring cleanser. 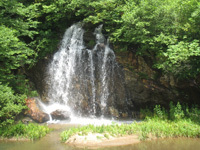 You’ll see the splashing Bon Ami waterfall, the Blacksmith Shop, and the Hidden Mine. In the underground portion of the mine you’ll see veins of smoky quartz overhead, lots of sparkly mica, and the railroad tracks and equipment used to get the ore out. Spend a few minutes in the Black Light tunnel and experience the vivid colors in this mine using special ultraviolet lamps. Come back for one of our special Blacklight Tours. Look for fish in the cold deep mine waters and watch the swallows fly in and out of the mine in season. Bring your camera and take all the pictures you want! You’ll love your visit to the North Carolina Mining Museum and the rare glimpse it offers inside our earth. Best of all, it’s just one of the many reasons to visit Emerald Village!